The Apolline Project is a multi-disciplinary research project which seeks to bring to light the hitherto neglected past of the area to the north of the spectacular Mt. Vesuvius and the Apennines. The project has several components, linked by our interest in the late antique eruption of Mount Vesuvius which occurred in AD 472. Major excavation work has up until recently focused upon the well preserved post-79 AD Roman baths at Pollena Trocchia. For this site, the study of artefacts continues with great results published annually. In 2015 we have brought our distinctive interest in post-79 AD also in Pompeii, and specifically at the Suburban Baths, where traces of resettlements have been found. In 2016, following the ashes of the Vesuvian eruption, we moved towards the Apennines, where we are bringing to light remains of the Roman city of Aeclanum, on the Via Appia. This year, in 2019, we are opening a new, thrilling chapter of late antique Campania, by digging the breathtaking, Imperial Villa of the Pausilypon, in Naples. Please have a look at the relevant pages in this website to know more about our general research questions and the methodology used in the study of pottery, ecofacts, and volcanic fills. The results gained so far have been presented worldwide and published in an edited book and in several articles, which you can download. In 2011 this project was awarded the European Archaeological Heritage Prize, especially in consideration of our commitment to the local community. The Apolline Project is also a registered non-profit organisation, thus we are legally committed to not make any profit from your donations and to spend the entire amount in activities which have a social impact, specifically to foster the research and to raise awareness of the past among the local population. Furthermore, we maintain a high level of scholarship and participation on our excavation, but pledge also to keep the participation affordable. This page provides some general information on our open projects, both fieldworks and classes, and how to apply for them. Please note that our projects are quite popular (we receive roughly 300 applications for each campaign), but we can host only a few people for each slot, therefore we encourage you to apply asap. The Apolline Project is now open to applications for the 2019 lab and field activities, which can be divided into: dig at the ancient city of Aeclanum, dig at the Pausilypon, human and animal osteology bootcamps, study the pottery assemblage from the Suburban Baths in Pompeii and Pollena, and courses on restoration! The Pottery and Restoration classes: the full study, restoration, and publication of the artefacts from the Suburban Baths in Pompeii and from the Roman Villa with baths in Pollena Trocchia are the major aims of the Apolline Project. The annual activities revolve around specific contexts and research questions, thus make the students partake in the interpretative process. We work in a supportive team structure where all team members are treated as peer, to help everyone achieve quality work. 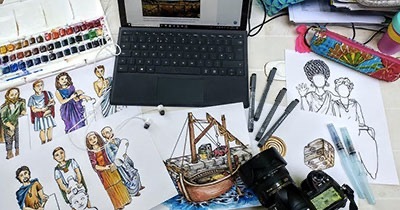 Students who are able to commit themselves to the project for longer periods of time are generally empowered with more responsibilities and opportunities to work on studies and publications of artefacts. Students interested in building careers as pottery specialists will benefit from the focused structure of training. The course on Roman pottery will run for four weeks, from 1st to the 26th of July, and will cover both the assemblages from the Suburban Baths in Pompeii and from the late antique site at Pollena Trocchia, providing in this way the unique opportunity to cover a wide timespan, from the 2nd c. BC to the end of the Western Roman Empire at the cost of 800 EUR. This program is the ideal option for those who are thinking about becoming a pottery specialist. The courses on study and restoration of the artefacts provide a comprehensive introduction to the current theories and practices in this fields. After a general overview on how to categorise the objects and identify the pottery classes and types, the students will participate in all activities involved in the restoration of the artefacts, from the documentation (description, drawing, photography) to the first cleaning (with brushes, scalpels, chemical solvents), from the consolidation to the stitching to the final integration, alongside with a set of basic skills on the study of Roman pottery. The courses will run from the 3rd to the 14th of June, from the 29th of July to the 9th of August, and from 19th to the 30th of August at the cost of 450 EUR each. Further information is available following this link. The Excavation of the Roman city of Aeclanum: Aeclanum (map) lies beyond the shores of Naples, Pompeii and Mt. 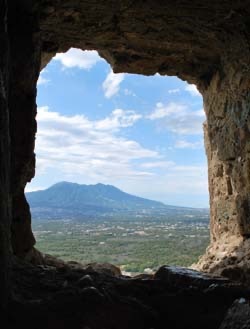 Vesuvius, in inner Campania and more precisely in the mountainous district of Hirpinia, which in antiquity constituted the outskirts between Campania and Apulia. Although the site is by no means small (at least 18 hectares), only a few buildings have been brought to light so far, notably several houses, part of the market building, an early Christian church, and a set of large Roman baths, which are extremely well preserved. The quality of the architectural remains and artefacts (including marble statues) brought to light so far is exceptional and speaks of a considerable level of wealth during the Roman and early Medieval periods. The Apolline Project has a special interest in Aeclanum and more broadly the entire area of Hirpinia, because the environmental model built for the environs of Vesuvius points to certain degrees of economic interdependence between the Campanian plains and the mountains of Hirpinia, thus Aeclanum works as an ideal control test for our theories. 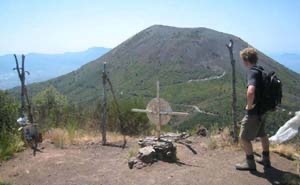 Similar to Pollena Trocchia and the North Slope of Vesuvius, Aeclanum and Hirpinia are ignored by the mainstream archaeological scholarship, which is still focused on Pompeii and Herculaneum, and thus this new chapter of the Apolline Project fuels our aim to shed light on previously ignored areas and to connect to the local population. Excavations in 2019 will focus on the area of the baths, the house with peristyle, and the macellum, where our understanding of late antique Aeclanum is increasing rapidly. Students will be exposed both to monumental Roman architecture and rich finds of associated materials, including marble, as well as to late antique interventions which have left behind a fascinating record of both remodelling and spoliation.This is a fantastic and rare opportunity for any student who wants to develop an understanding of how an excavation starts, from the ground up, and experience the complexity of dealing with Roman urban stratigraphy. A combination of survey and excavation also provides a well-rounded archaeological experience, while additional opportunities for working on ceramics and marble finds will be provided. The Summer fieldwork 2019 will take place from the 17th of June to the 26th of July and students can apply from a minimum of two weeks to the entire period. Further details on program and deadline is available at this page. The excavation of the Roman villa of the Pausilypon: this villa is one of the most important - and weirdly enough one of the less studied - in the whole Roman world. Its name literally means “break from pains” and consists of a few buildings spread on the beautiful rocky peninsula on the western edge of Naples. It was built, in grand and lavish style, by Publius Vedio Pollio, who bequeathed it to the emperor Augustus in 15 BC, who then passed it to the following emperors of Rome. Embellished with a theatre, an odeon, and several buildings, it was even described as a proper city by Ovid. Despite its greatness and cultural importance, this building has never been published properly as a whole (apart from a survey of what was visible in 1913 by R.T. Günther) and many portions still lie underground. The new excavation project, led by the local Heritage authority (Superintendency) in collaboration with the University of Bologna and our support, seeks to investigate the area commonly known as the “house of Pollio”. This area encompasses a few buildings, probably part of the private quarters of the villa, for which we have very scant information. During the first pilot season much late antique evidence has been brought to light, while most of the architectural features can be dated between the 1st c. BC and the Hadrianic period. The 2019 fieldwork will take place from the 2nd of September to the 12th of October and students can apply from a minimum of two weeks to the entire period. The cost for two weeks is 500 EUR, four weeks 900 EUR, six weeks 1300 EUR. Students will be based in Pollena Trocchia, from where we’ll provide transportation for the daily commute. Follow this link to apply. The Study of Zooarchaeology: the course we offer aims to present the basic principles of this discipline to interested students without prior experience and, for the student already dealing with zooarchaeological research, to present the opportunity to practice laboratory work and gain experience with the identification of the Campanian fauna. Our one-week course will combine theory lectures and direct laboratory practice on newly excavated material. It will deal with the basic notions of anatomical identification, zoological taxonomy, familiarisation with the fauna of ancient Roman Campania, quantitative and qualitative analysis of bone data. Taphonomy will be discussed, both as a post-depositional phenomenon and as a consequence of human intervention, dealing with burn and cooking marks, different kinds of cut-marks, fragmentation and other physical traces on the bones. The course will take place from the 12th to the 16th of August and costs 350 EUR. Further details can be found here. The Study of the Human Bones: for those interested in learning how to interpret a historic skeletal assemblage, the Apolline Project is offering two-week intensive classes in physical anthropology. Students will be instructed and immersed in the practical application of techniques used to correctly analyse human remains and will play an integral role in helping to better understand the previously unstudied collections. In general, days will begin with a formal lecture, followed by practical learning on the human remains. The next workshops will take place from July 29th to August 9th (at Aeclanum) and from the 19th to the 30th of August (at Pollena), each at the cost of 650 EUR. To know more, please go to this page. Please follow this link and complete the electronic application. Applicants are required to provide name and contact information of a relevant person – such as a professor or previous excavation supervisor – who can verify the details you provide in your application. Any application submitted will be strongly considered and processed within three weeks (unless you need to know it earlier for a grant proposal with your University, in that case please specify it in the application). However, there is a limited number of spaces so the earlier you apply the greater your chances of being accepted. We offer a select number of scholarships to participants to the pottery course in Pollena Trocchia, each worth 500 Euros. To apply, please have two letters of recommendation sent by your referees to secretary@apollineproject.org. These letters and your project application will be used to evaluate your eligibility for the scholarship. We do require payment in advance of the scholarship decision. The awardee(s) will be given the scholarship prize on site as a reimbursement. We guarantee transportation from the main train station in Naples to the location of the program chosen, either Pollena Trocchia or Mirabella Eclano, as well as transfer from one location to the other, for those who combine programs. For those staying in Pollena Trocchia, public transport in the area – including trains and buses – is good and participants will be able to move around the area with ease. Pollena Trocchia is connected to Naples via the Circumvesuviana train network, a one-way ride costs € 2.10 and lasts about 20 minutes. From Naples a train ride to Pompeii lasts about 30 mins and roughly one hour to Rome. For students participating on Aeclanum excavations or training courses (thus based in Mirabella Eclano), travel options are more challenging to arrange. There are no trains connecting the town to Naples, so we will organise field trips once per block on the weekends at no extra cost to the students, as well as transportation to Naples’ train station at the end of each block. Staff and returning students will be able to help any participants plan excursions to Naples or Benevento should they want to travel to these locations themselves. If your application is successful you will be provided with further logistical information in a welcome email. 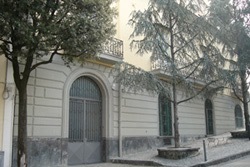 For international participants to the lab work in Pollena Trocchia and Pompeii, accommodation will be provided at Cappabianca – a late 19th-century palazzo. Guests should expect the amenities to be on par with what is generally expected when staying in a hostel. For international participants this is included in the price, along with kitchen, showers and washing facilities. If preferred, at extra cost it can be arranged for students to stay in local hotel accommodation, although students generally prefer to stay in Cappabianca. For international participants to the other projects based at Aeclanum, a former school in dormitory conditions is available. The Apolline Project is not a company nor makes financial gain from the activity that it runs. It is an open network of scholars who make research, restoration, and public archaeology. It uses a legally-recognised non-profit organisation to collect and use funds. Please consider donating, we do need your support and generosity to continue our activities and raise awareness of the past.